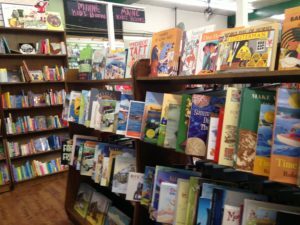 Join me at Boothbay Railway Village for a reading of Charlie on the M.T.A. Did He Ever Return? CELEBRATE FALL WITH US! Music, sheepdog demonstrations, butter churning, cider pressing, hayrides, blacksmith, weaving, spinning, and lace-making demonstrations, pumpkin decorating and more! This year Castlebay, the music duo whose performances of Celtic and Maine music combine rousing dance tunes with the magical world of tall tales, will perform at 1:00 pm on Saturday. Throughout the day on Sunday, Two Coves Farm of Harpswell will give sheep dog demonstrations. On both Saturday and Sunday White’s Farm of Winterport will be selling their hot dogs and sausage, and author Julia O’Brien-Merrill will read her delightful children’s book Charlie on the M.T.A. Did He Ever Return? about the real Charlie from the famous song about a man stuck on the Boston subway. Make your own apple or pear cider with our apple press! Bring your own fruit – make sure it has been washed – and your own containers, and use our press (see safety instructions here). On both days there will be farm animals from Lyric Meadow Farm, hayrides, blacksmith, weaving, spinning, and lace-making demonstrations, barrel-train rides, and pumpkin decorating. Hand-sew your own journal at the craft table. Watch butter being churned and taste the fresh butter on New England brown bread baked according to a 100-year-old recipe. There will be cider and homemade cookies for all. The Museum’s pair of resident goats as well as some special guests will be on hand. Take a hayride to a pumpkin patch where for a small additional fee you can take home your own pumpkin! You may decorate your pumpkin at our craft table. Family Harvest Days is just one stop along Maine’s Pumpkin Trail, a partnership celebrating history, art and giant fruit along 50 miles of what we think is Maine’s most beautiful coastline! Follow Maine’s Pumpkin Trail on Facebook to discover great ways to celebrate fall with friends and family of all ages. Special thank you to our event sponsor, Flagship Inn & Suites! And thank you Jim Kearney for loaning us your cider press! Admission is free for Museum Members and included with Museum Admission for non-members. When you work with children you never know what is going to impact them…. When you work with children you never know what is going to impact them, and most times you never learn what impact you have had on them. But sometimes you get a surprise. 20+ years ago I began singing and playing my guitar once a week with the 4th grade at Pemetic. It started when my Jenn was in 4th grade and they kept asking me back. I took it as a challenge to find songs that the boys would sing along with. There was no show choir then, so singing wasn’t as “cool as it is in our schools now. So I taught sea chanteys and “Charlie on the MTA”, and other fun or silly songs. I was asked back to sing with several 4th grade classes. I really have no idea how many. Today, a mom from one of those classes brought me this brand new book, published July 25, 2017, and told me about how I taught a generation of SWH kids about Charlie. Thank you Marjory Russakoff! You totally made my day. It may be time to dust off the old guitar . . .
BTW ~ The Author’s father was the man for whom the original song was created. 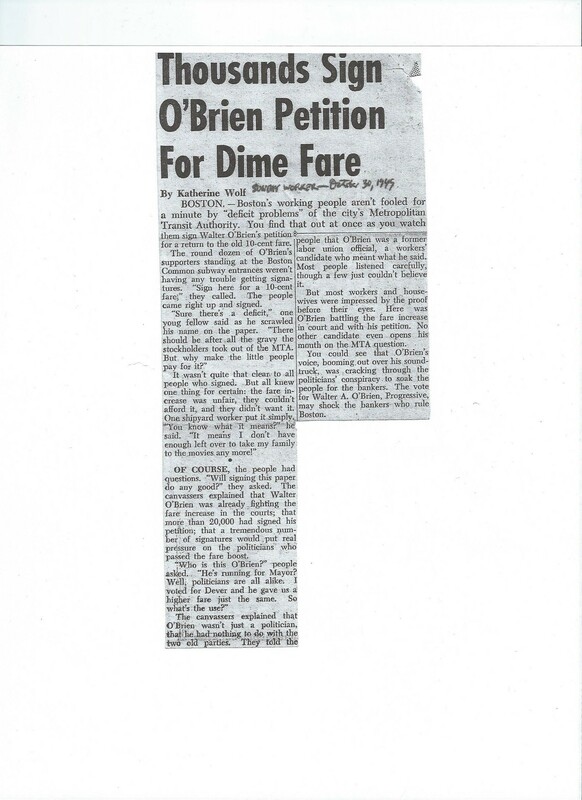 He ran for Mayor of Boston and the song was a protest about the increase in fares (from a dime to 15 cents) which in 1949 was substantial Today, the Charlie Card honors Walter O’Brien. He never became mayor, but he will never be forgotten! 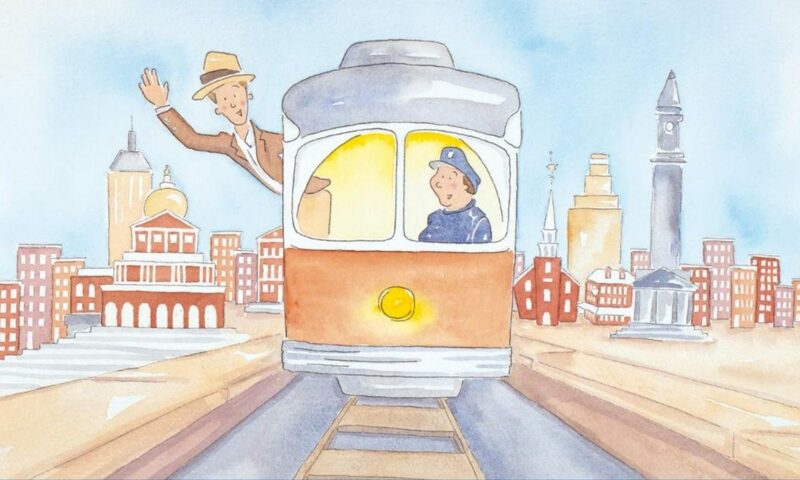 In 1949 citizens of Boston were faced with a fare increase from a dime to fifteen cents. “Charlie” was created in a song by Jacqueline Steiner and Bess Lomax Hawes to help fight the fare increase as one of Walter A. O’Brien’s campaign issues. I am forever grateful to Caitlin Marquis for her amazing illustrations, as well as to Phil Zuckerman and Jennifer Delaney for their belief in the project.